The wedding was in full swing. The guests were having a grand time when suddenly someone realized there was a problem. The wine had run out. What an embarrassing situation for the host! Clearly there was a need. The wedding was not over, and the guests would be expecting to have more to drink. Scripture doesn't tell why the wine ran out at that wedding in Cana. Maybe that amount was all the family could afford. Maybe the wedding planner underestimated the number of guests. Mary knew that regardless of the reason for the shortage, her Son could remedy the situation, even though He had gently protested when she brought it to His attention. She called to the servants at the feast and told them, "Just do what He tells you." The servants did exactly what Jesus commanded. He told them to fill the waterpots, and they filled them to the brim. 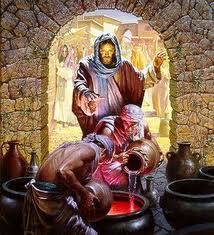 He told them to immediately draw out some of the liquid and take it to the master...and they obeyed. They didn't stop to figure out if it made sense. They didn't argue or question. They simply did what He told them to do. The result was that potential embarrassment was averted, and a problem was solved...in greater measure than anyone could have anticipated. The world system thrives on compromise. 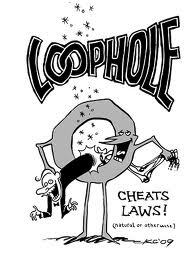 A law is created and people immediately try to find the loophole that would weaken its effectiveness. However, God's Word has no loopholes. King Saul found that out the hard way. God instructed him to kill all of the enemy, leaving nothing and no one alive. But Saul tried to find a loophole to suit himself. Saul obeyed God's word only partially, choosing to keep the best things alive. As a result the kingdom was stripped from him and God anointed David to be king in his place. We often do the same thing....giving up the things (behaviors, relationships, attitudes) that don't matter much, but choosing to hold on to those that are most dear to us. just do what He tells you. Amen! Thank you for this good word...challenging...encouraging word today! You wrote this just for me today. I go back and forth about an issue. Simple answer. Do whatever HE tells me! So true. We need to take this more seriously. Seems everyone is looking for "loopholes."